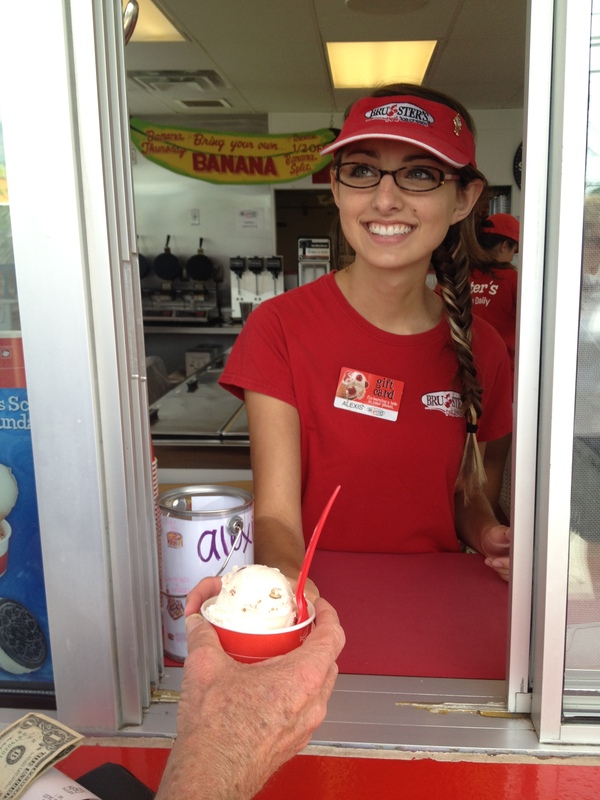 Cool Off 2012: Bruster’s Real Ice Cream | Oh, the Places We See . 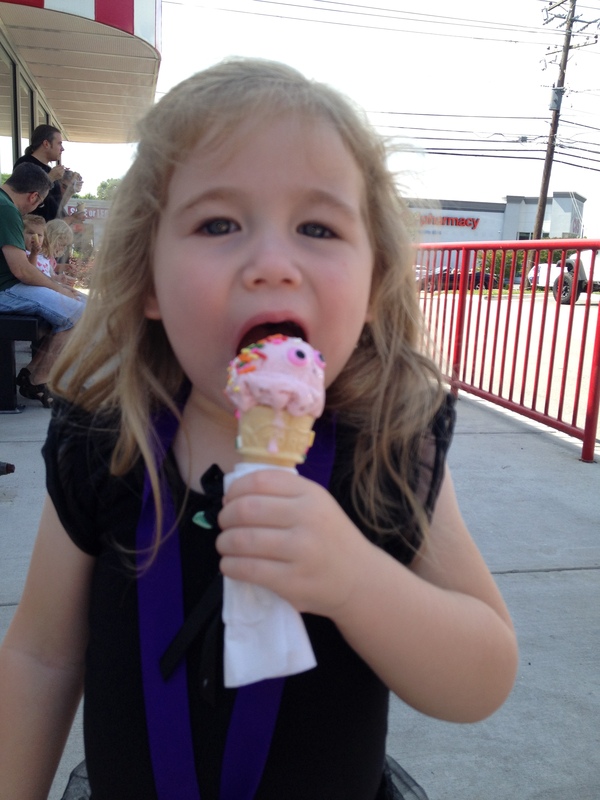 . .
Whitley loves the free Kiddie cone with sprinkles on top from Bruster’s! It’s unusual that we visit chain restaurants or chain ice cream shops or chain anything — we love to see what’s local! We want to find out who owns a Mom-and-Pop establishment and what they serve and what’s unique. But Bruster’s Real Ice Cream — one of the fastest growing ice cream chains in the country is an exception! Bruce Reed opened the first Bruster’s Real Ice Cream (love the word real in the title) in Bridgewater, Pennsylvania, in 1989. 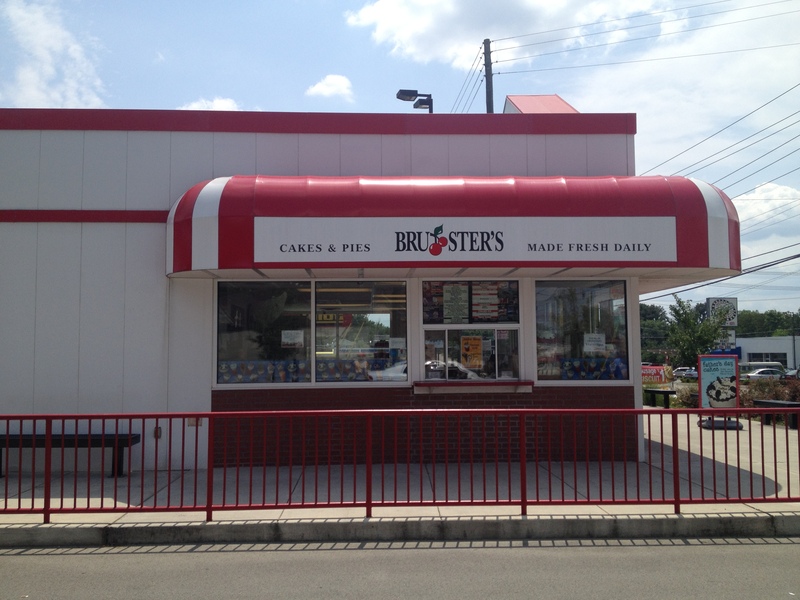 We stumbled upon Bruster’s on Cedar Bluff Road (West Knoxville) about three years ago. From then on, we’ve rarely visited another place for order-at-the-window consume-on-spot ice cream! It’s the richest, creamiest, homemade-tasting ice cream anywhere nearby. Well, it’s no wonder why we’ve joined the customer line. The cones and cups we order (2 scoops, 2 flavors!) are filled with generous portions of a very creamy, very tasty, almost sinful ice cream. Bruster’s offers over 150 flavors, and each store makes 24 different flavors per day (Chocolate, Vanilla, and Strawberry required) right there on site along with cakes, pies and crispy waffle cones! 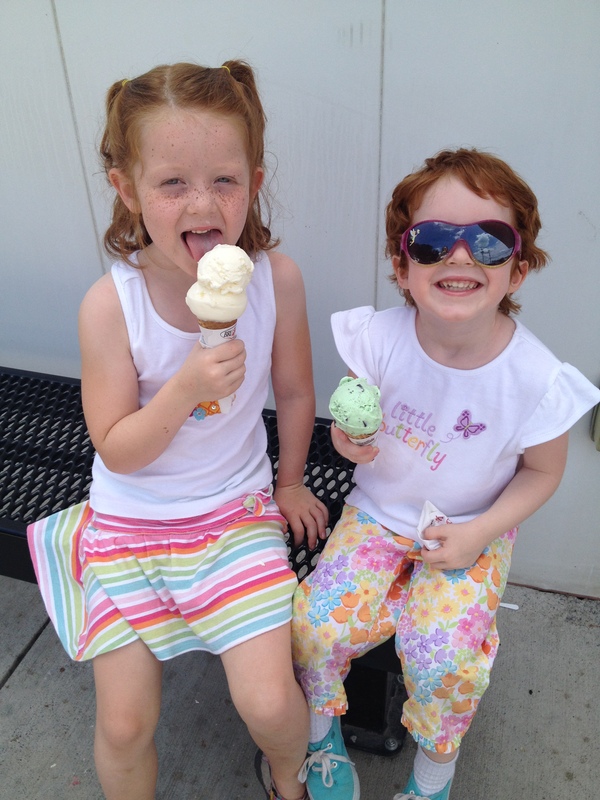 Two little fans of Bruster’s all the way from Chicago! Flavors they’ve got — some with rather intriguing names: Deep Dish Apple Pie, Gone Bananas, Jamaican Me Crazy, Monkey Madness, Peanut Butter Brittle, Purple Dinosaur, Smores, and on and on and on! 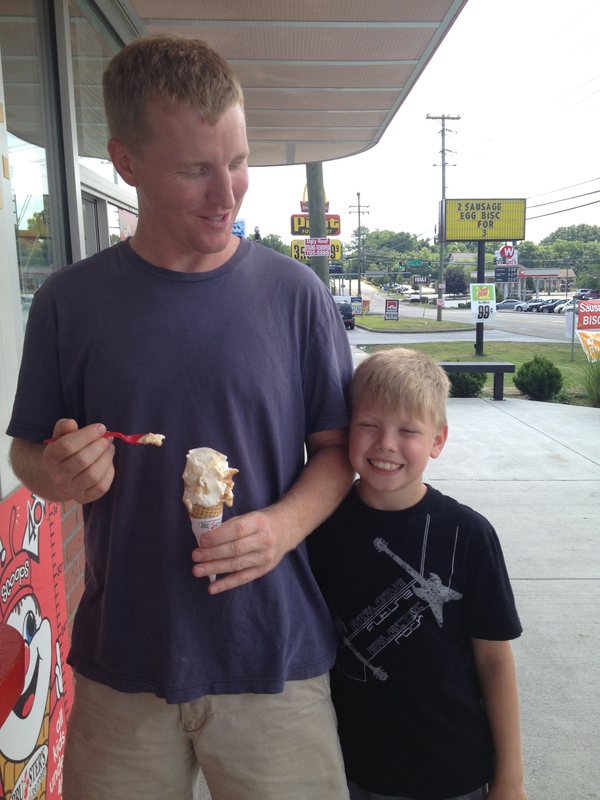 A dad treating his son to Bruster’s, but note who’s holding the ice cream! Bruster’s Real Ice Cream is a kid magnet. Moms and Dads want to treat their kids, but we’ve noticed the grown-ups aren’t denying themselves, either. Some even order more than the single cones — they go all the way by reserving cakes for special days: holidays, birthdays, anniversaries, etc. 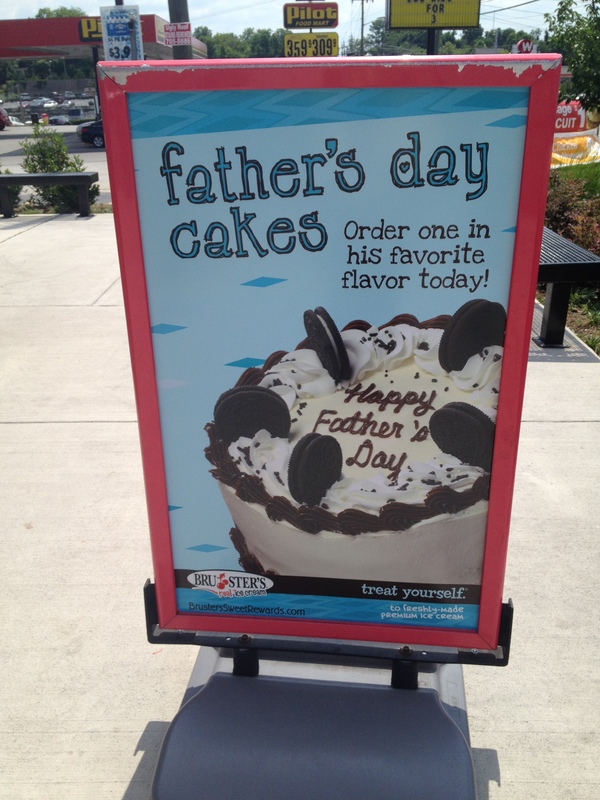 Special treats for special days at Bruster’s! Others ask for the free Kiddie cone for kids who are just so tall! 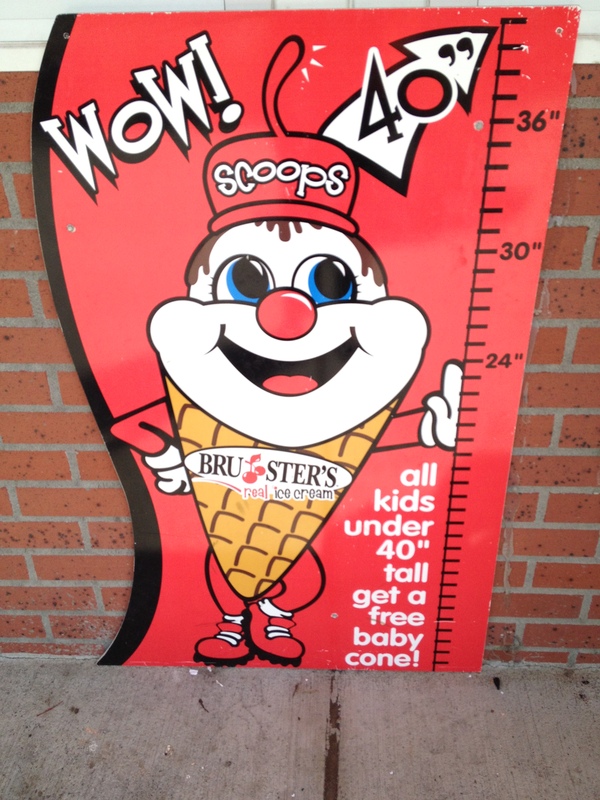 Free Kiddie cone if you’re no taller than 40 inches! No matter if you’re old or young, you gotta try Bruster’s Real Ice Cream. It’s especially good when it’s hot outside, and you need a cold, creamy treat. 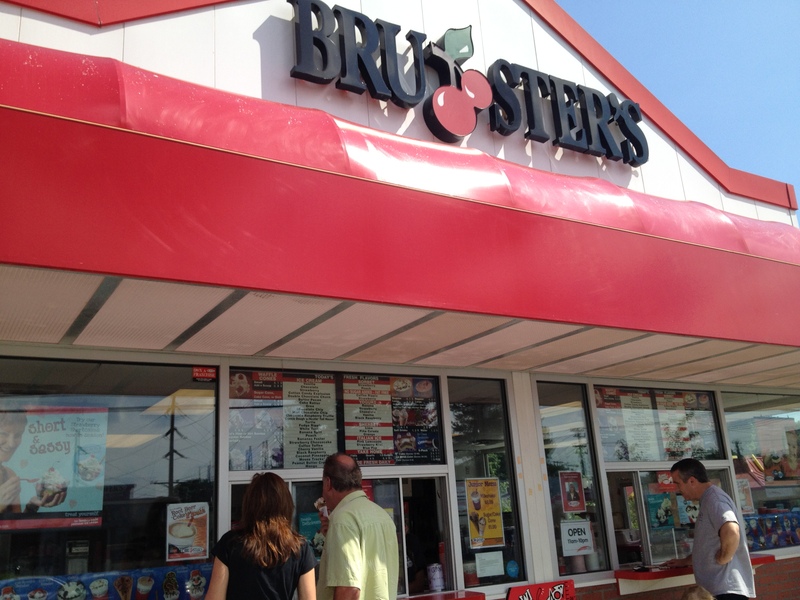 But just about any time can be Bruster Time. When you go there, you’ll get your order served up with a smile! Alexis hands Bert a cup of Banana Chocolate Chip. 150 flavors — Get ’em to email or text you when your favorite flavor is in the store! Banana Thursday – Bring your own banana and only pay half for a banana split! PJ Day — Wear your pajamas on PJ Day! Reward: a free single-scoop waffle cone! Kid at Heart — Over 60? Sign up to get 25 cents off each purchase each visit! Quart Club — Buy 6 quarts of hand-packed ice cream, and get the seventh one free! This entry was posted in Restaurant and tagged Cool Off, dessert, ice cream, Knoxville. Bookmark the permalink. Pingback: Cool Off 2012: Razzleberry’s in Oak Ridge | Oh, the Places We See . . .